Duke University Libraries (DUL) is always searching for new ways to increase access and make discovery easier for users. One area users frequently have trouble with is accessing online articles. Too often we hear from students that they cannot find an article PDF they are looking for, or even worse, that they end up paying to get through a journal paywall. 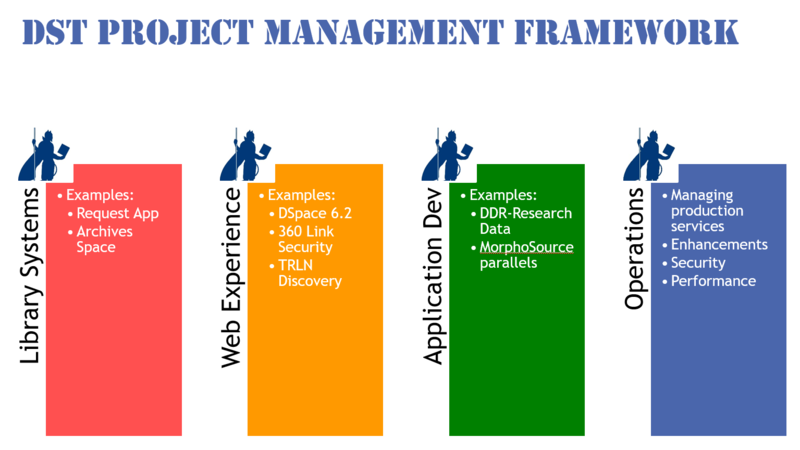 To address this problem, DUL’s Assessment and User Experience (AUX) Department explored three possible tools: LibKey Discovery, Kopernio, and Lean Library. After user testing and internal review, LibKey Discovery emerged as the best available tool for the job. LibKey Discovery is a suite of user-friendly application programming interfaces (APIs) used to enhance the library’s existing discovery system. The APIs enable one-click access to PDFs for subscribed and open-source content, one-click access to full journal browsing via the BrowZine application, and access to cover art for thousands of journals. The tool integrates fully with the existing discovery interface and does not require the use of additional plug-ins. According to their website, LibKey Discovery has the potential to save users thousands of clicks per day by providing one-click access to millions of articles. The ability to streamline processes enabling the efficient and effective discovery and retrieval of academic journal content prompted the AUX department to investigate the tool and its capabilities further. 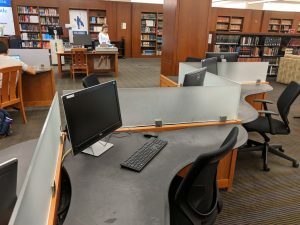 An internal review of the system was preceded by an introduction of the tool to Duke’s subject librarians and followed with a preliminary round of student-based user testing. Both the AUX staff and the subject librarians who performed an initial review of the LibKey Discovery tools were impressed with the ease of article access and full journal browsing. Three members of the AUX department independently reviewed LibKey’s features and concluded the system does provide substantial utility in its ability to reduce the number of clicks necessary to access articles and journals. The tool streamlines the appearance and formatting of all journals, thus removing ambiguity in how to access information from different sources within the catalog. This is beneficial in helping to direct users to the features they want without having to search for points of access. The AUX department review team all found this helpful. LibKey Discovery’s APIs integrate fully into the existing DUL discovery interface without the need for users to download an additional plug-in. This provides users the benefit of the new system without asking them to go through extra steps or make any changes to their current search processes. Aside from the new one-click options available within the catalog’s search results page, the LibKey interface is indistinguishable from the current DUL interface helping users to benefit from the added functionality without feeling like they need to learn a new system. LibKey Discovery carries a relatively hefty price tag, so its utility to the end-user must be weighed against its cost. While internal review and testing has indicated LibKey Discovery has the ability to streamline and optimize the discovery process, it must be determined if those benefits are universal enough to warrant the added annual expenditure. A potential downside to LibKey Discovery is lack of consistency in one-click options between articles. While many articles provide the option for easy, one-click access to a PDF, the full text online, and full journal access, these options are not available for all content. As a result, this may cause confusion around the options that are available for users and may diminish the overall utility of the tool depending on what percentage of the catalog’s content is exempt from the one-click features. 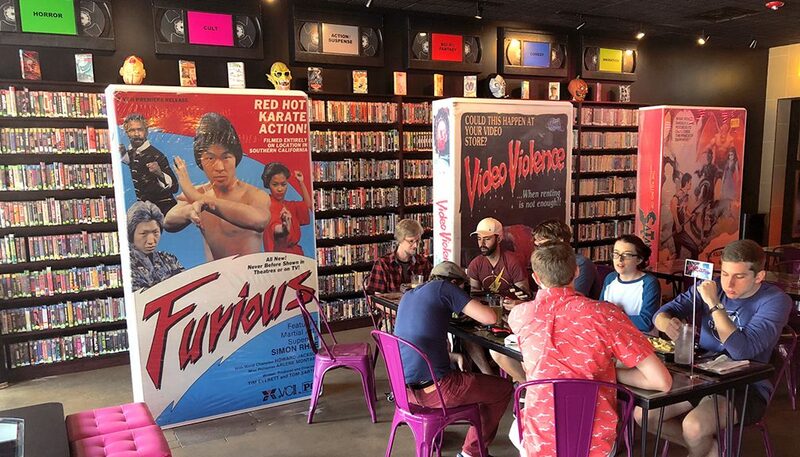 An initial round of user testing was completed with ten student volunteers in the lobby of Perkins Library in early April. 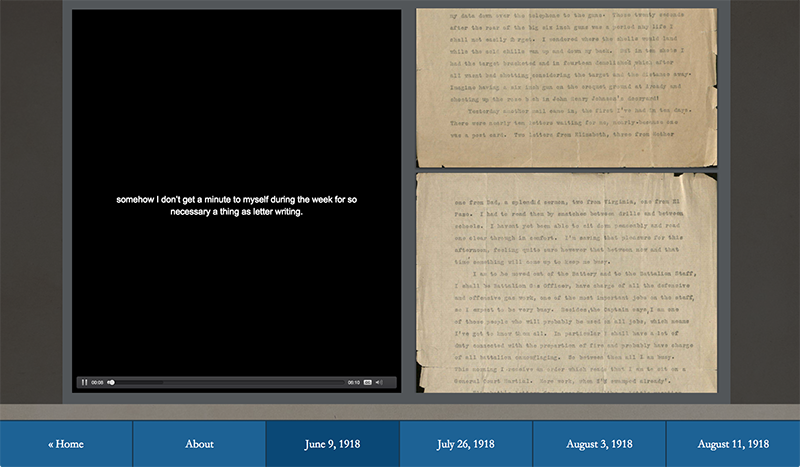 Half of the users were asked to access an article and browse a full journal in the existing DUL system; the other half were asked to perform the same tasks using the LibKey Discovery interface. Initial testing indicated that student users had a high level of satisfaction with the LibKey interface; however, they were equally satisfied with the existing access points in the DUL catalog. The final recommendations from the user testing report suggest the need for additional testing to be completed. Specifically, it was recommended that more targeted testing be completed with graduate-level students and faculty as a majority of the original test’s participants were undergraduate students with limited experience searching for and accessing academic journal issues and articles. It was concluded that testing with a more experienced user group would likely produce better feedback as to the true value of LibKey Discovery. LibKey Discovery is a promising addition to Duke’s existing discovery system. It allows for streamlined, one-click article and full journal access without disrupting the look and feel of the current interface or requiring the use of a plug-in. Initial reviews of the system by library staff have been glowing; however, preliminary user testing with student participants indicated the need for additional testing to determine if LibKey’s cost is sufficiently offset by its utility to the user. 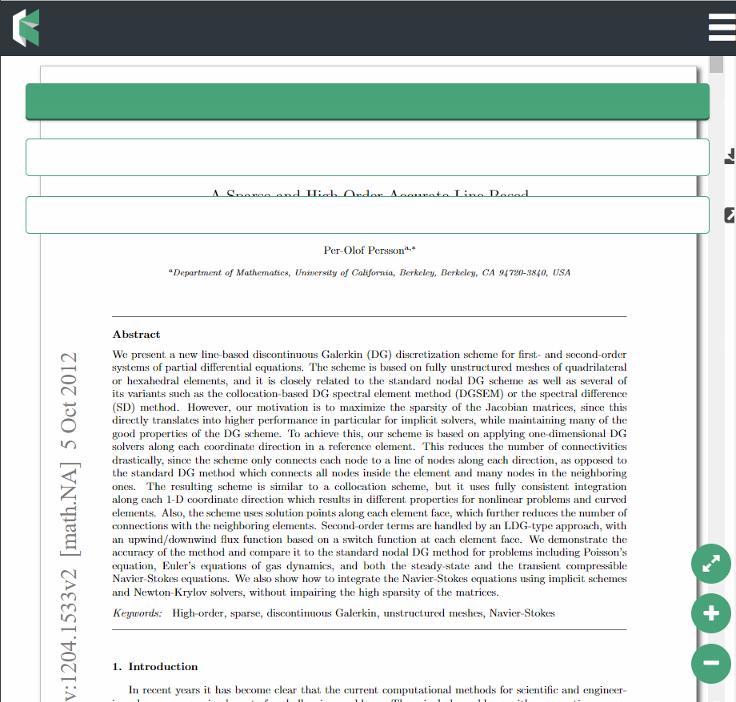 Kopernio is a free browser plug-in which enables one-click access to academic journal articles. It searches the web for OA copies, institutional repository copies, and copies available through library subscriptions. 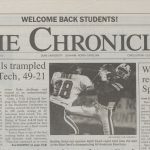 The tool is designed to connect users to articles on and off campus by managing their subscription credentials and automatically finding the best version of an article no matter where a user is searching. Given the potential of this tool to help increase access and make discovery easier for students, the AUX department initiated an internal review process. 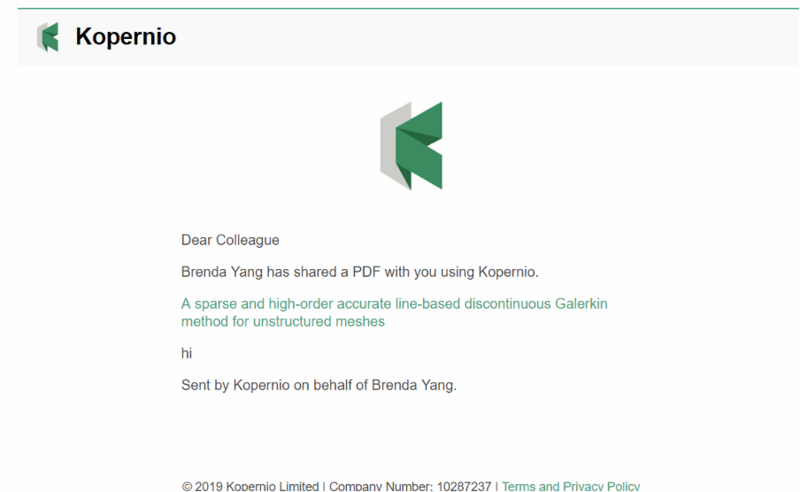 Four members of the department independently downloaded the Kopernio plug-in, thoroughly tested it in a variety of situations, and shared their general and specific notes about the tool. By its design, Kopernio has an advantage over other plug-in tools that serve a similar function (i.e. Unpaywall). When users first download Kopernio they are asked to register their subscription credentials. This information is saved in the plug-in so users can automatically discover articles available from OA sources, as well as library subscriptions. This is an advantage over other plug-ins that only harvest from freely available sources. Kopernio has highly visible and consistent branding. With bright green coloring, the plug-in stands out on a screen and attracts users to click on it to download articles. Kopernio is advertised as a “one-click” service, and it pays off in this respect. Using Kopernio to access articles definitely cuts down on the number of clicks required to get to an article’s PDF. The process to download articles to a computer was instantaneous, and most of the time, downloading to the Kopernio storage cloud was just as fast. Kopernio’s most advertised strength is its ability to manage subscription credentials. Unfortunately, this strength is also a major data privacy weakness. Security concerns ultimately led to the decision to disable the feature which allowed users to access DUL subscriptions via Kopernio when off-campus. Without this feature, Kopernio only pulls from OA sources and therefore performs the same function that many other tools currently do. Similar to data privacy concerns, Kopernio also raises copyright concerns. One of Kopernio’s features is its sharing function. 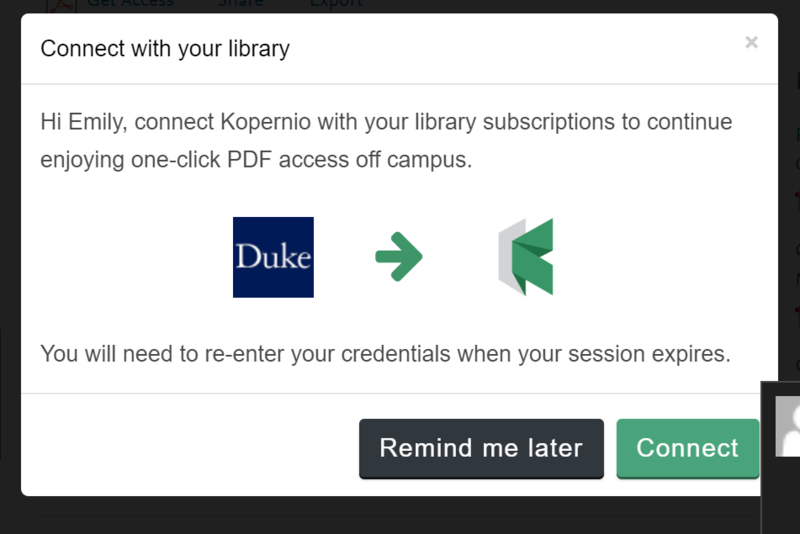 You can email articles to anyone, regardless of their university affiliation or if they have downloaded Kopernio already. 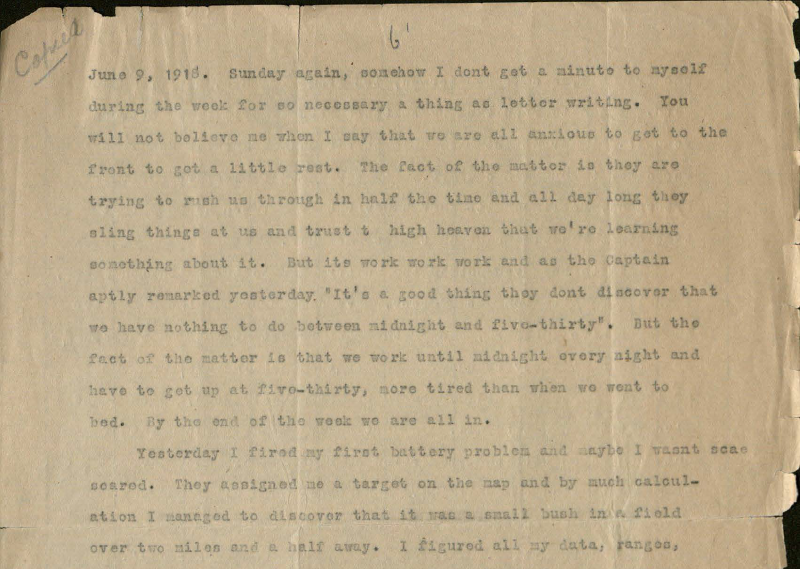 We tested sending DUL subscription PDFs to users without Duke email addresses and they were able to view the full-text without logging in. It is unclear if they were viewing an OA copy of the article, or if they were seeing an article only meant for DUL authenticated users. Running the Kopernio plug-in noticeably slowed down browser speed. 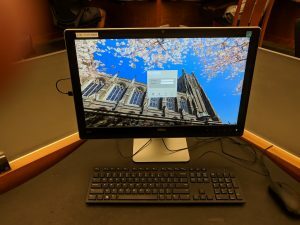 We tested the browser on several different computers, both on campus and off, and we all noticed slower browser speeds. This slow speed led Kopernio to be occasionally buggy (freezing, error messages etc.). When articles are saved to Kopernio’s cloud storage, users can add descriptive tags. We found this feature awkward to use. Instead of adding tags as you go along, users have to add a tag globally before they can tag an article. Overall, it seemed like more hassle than it was worth. Kopernio automatically imports article metadata to generate citations. There were too many problems with this feature to make it useful to users. It did not import metadata for all articles that we tested, and there was no way to manually add metadata yourself. Additionally, the citations were automatically formatted in Elsevier Harvard format and we had to go to our settings to change it to a more common citation style. Lastly, the cloud storage which at first seemed like an asset, was actually a problem. All articles automatically download to cloud storage (called the “Kopernio Locker”) as soon as you click on the Kopernio button. This wouldn’t be a problem except for the limited storage size of the locker. With only 100MB of storage in the free version of Kopernio, we found that after downloading only 2 articles the locker was already 3% full. To make this limited storage work, we would have to go back to our locker and manually delete articles that we did not need, effectively negating the steps saved by having an automatic process. 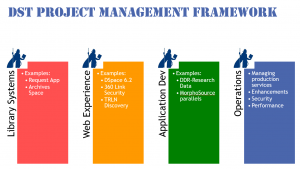 Lean Library is a similar tool to Kopernio. It offers users one-click access to subscription and open access content through a browser extension. 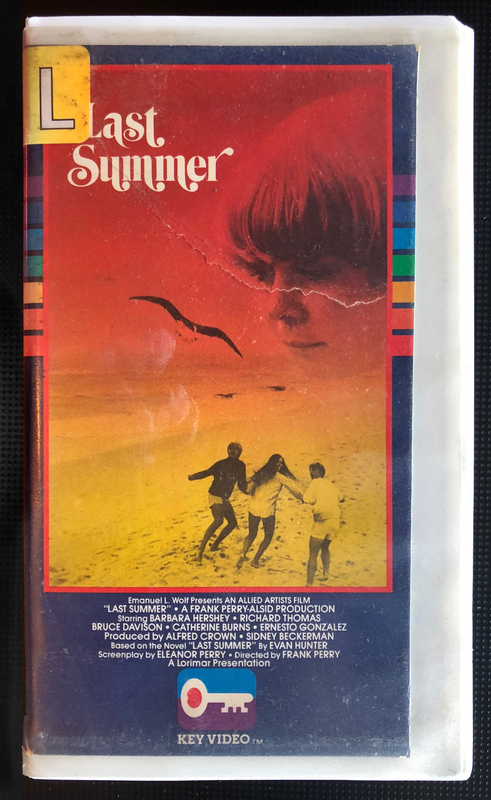 In Fall 2018, DUL staff were days away from purchasing this tool when Lean Library was acquired by SAGE Publishing. DUL staff had been excited to license a tool that was independent and vendor-neutral and so were disappointed to learn about its acquisition. We have found that industry consolidation in the publishing and library information systems environment has lowered competition and resulted in negative experiences for researchers and staff. Further, we take the privacy of our users very seriously and were concerned that Lean Library’s alignment with SAGE Publishing will compromise user security. Whenever possible, DUL aims to support products and services that are offered independently from those with already dominant market positions. For these reasons, we opted not to pursue Lean Library further. Of the three tools the AUX Department explored, we believe LibKey Discovery to be the most user-friendly and effective option. If purchased, it should streamline journal browsing and article PDF downloads without adversely affecting the existing functionality of DUL’s discovery interfaces. It’s that time of year at the university when we’re working on our PEPs (Performance Evaluation and Planning forms) and I’m thinking about how grateful I am to have such smart staff who really care about their work, their colleagues, and the people they serve, as we advance technology across the libraries. In contrast to some corporate environments, the process here really does aim to help us improve, rather than rank us as a setup for “resource actions” (firings). 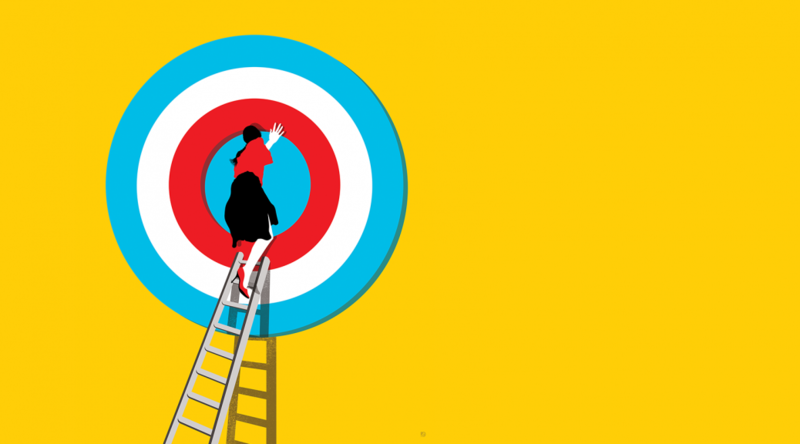 This excellent article, The Feedback Fallacy by Marcus Buckingham and Ashley Goodall, reminds me to emphasize the things people do well, and encourage them to build on their strengths. Attuned to ethical practices within organizations, I’m also excited about increasing awareness of ethics in the effects of the technologies we produce. Justin Sherman, co-founder of the Ethical Tech initiative here at Duke, did a stimulating talk at the Edge Workshop this month about ethical issues that surround technology, such as search engine bias, and AI tools that judges use to determine sentencing for crimes. Justin recommends this podcast, with Christopher Lydon on Open Source, called Real Education About Artificial Intelligence. Library staff are participating in the Kenan Institute for Ethics book club program (KIE), where the spring selection is Algorithms of Oppression: How Search Engines Reinforce Racism by Safiya Umoja Noble. And, I’m pleased to exercise my hiring mantra, “smart people who care”, which has served me well for over 30 years, as we’re recruiting candidates with I/T and team leadership experience for a new position, Computing Services Supervisor. It’s all but impossible to use the internet and not be aware of the sheer quantity of advertising out there. Some estimates suggest Google alone serves out nearly 30 Billion ads per day; other estimates suggest 300-700 ads are shown per person per day. In trying to get more eyeballs on their images, advertisers have resorted to more and more intrusive ad displays — pop-over ads (so you can’t see content until you close the ad), pop-under ads (so even after you’ve left the site, you’ll see one more ad), animated gifs (the motion naturally causes your eye to look at it), auto-playing (and loud) videos. More recently, ads have even been implicated in malware attacks. 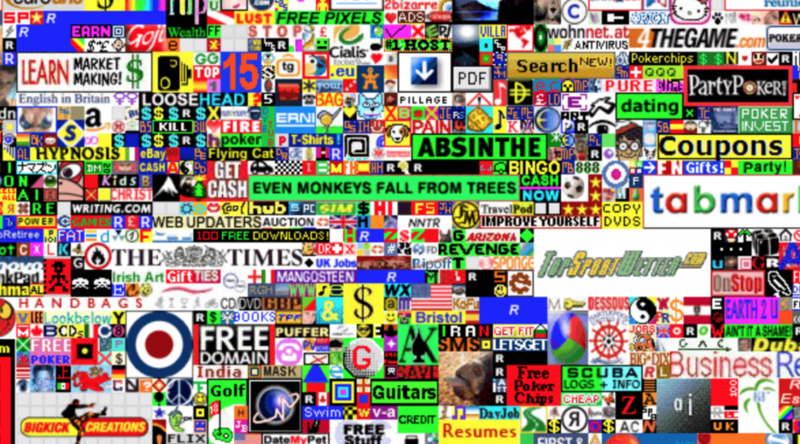 So it’s no surprise that ad-blocking technology is now mainstream. All major browsers have multiple ad-blocker plug-ins, and any list of “Best Add-Ons for <browser>” will likely include at least one. By blocking ads, these plugins reduce the annoyance of the ads while also helping protect your privacy by reducing sites’ ability to track you. As an additional bonus, they can also accelerate your web browsing — by not downloading all that ad content, you’re able to see the “real” content faster. A New York Times article showed that between 33% and 50% of the time to download a page was due to advertising — and in extreme cases, advertising could be 80% or more of the time to download and view a webpage. In IT-Core Services, we had intended to deploy an ad-blocker to all of the public computers in order to allow our patrons and users to block ads while they were doing work, collecting papers, or doing research on Library computers. The plugin is called “uBlock Origin” and is one of the leading open-source ad-blockers around. We accidentally pushed it to all public AND staff computers several months ago. 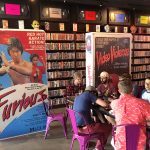 Given the very few number of tickets we’ve seen about it, we’re guessing people either didn’t notice, or else welcomed the arrival of uBlock. 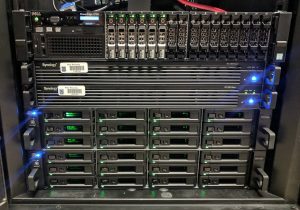 We’re now planning on keeping uBlock deployed on all staff and public computers. 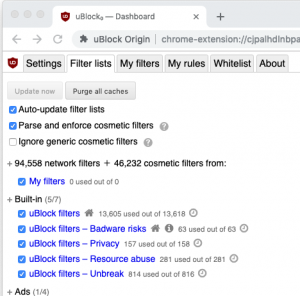 We feel that the privacy, performance, and security benefits of uBlock outweigh the desire for a “ad-full” web experience — and you can easily un-block any websites you want to, if you find that the blocker is somehow interfering with that site. To unblock the websitethat you’re visiting — that is, to show the ads on the page — look for the uBlock logo (a brick-red shield) at the top of the main browser window. Clicking that logo will pop up a dialog box like this: By clicking on the power-button symbol (circle with the line at the top), you’ll tell uBlock to NOT block ads on that webpage in the future. You should then reload the page to get the ad-full experience (by default, un-blocking a website does NOT reload or re-display the ads, you must explicitly reload the page). Note: if the uBlock logo is grey, or the power-button icon is grey, then the current website is already un-blocked (and the browser is showing you the ads). Click on the “Filter Lists” tab and you’ll see a set of “Filter” checkboxes. Each checkbox represents a set of websites that are to be blocked (checked) or unblocked (unchecked). 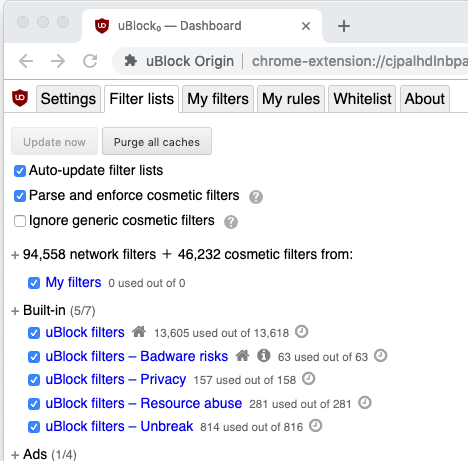 To unblock all websites — to essentially deactivate uBlock Origin altogether — just uncheck all of the Filter sets. FWIW, most of the filter-sets have Home icons where you can find more info on what that filter-set does (e.g. “Malware Domains” links to a website at malwaredomains.com, which is run and maintained by the company RiskAnalytics). If you have any questions, please just submit a ticket and someone will get back to you. While a great many websites will work fine with uBlock Origin installed, it turns out the Library’s own newsletter system does NOT! If you are experiencing problems with the newsletter, go into the uBlock settings (process described above) and go to the “Filter Lists” tab. One of the filter-sets at the bottom is named “Peter Lowe’s Ad and tracking server list” — this is the one that seems to catch the iContact server used by our newsletter. If you disable that (the box will be un-checked), then reload the page, you should be back in operation. Sorry! 2018 has featured several monumental changes in the library’s technology platforms. One of the most impactful shifts this year was revitalizing DukeSpace, our DSpace-based institutional repository (IR) software, home to over 16,000 open-access articles, theses, and dissertations from Duke scholars. 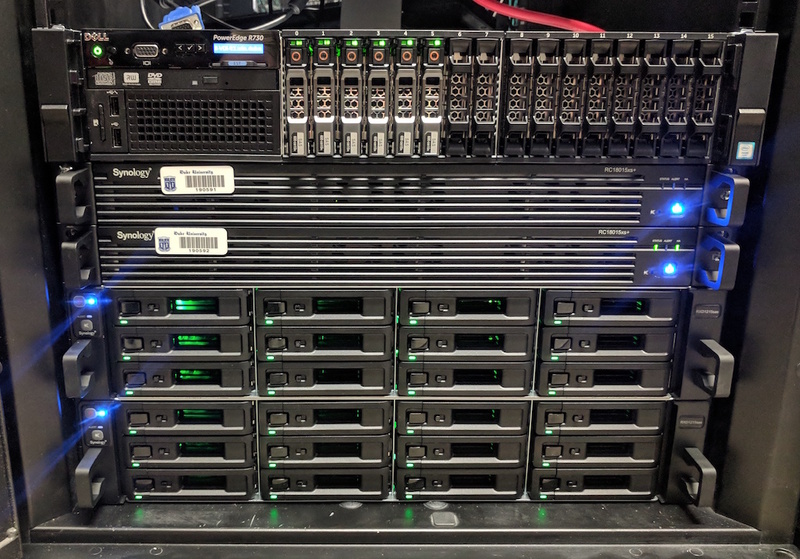 Back in March, we celebrated a successful multi-version upgrade for DSpace, and along with it, a major upgrade to the integral Symplectic Elements Research Information Management platform. On the heels of that project, we decided to capitalize on the project team’s momentum and invest two more months of focused attention (four “sprints” in developer-speak). The goals for that period? First, tie up the loose ends from the upgrade. Then, seize some clear opportunities to build upon our freshly-rearchitected metadata, creating innovative features in the UI to benefit scholars. 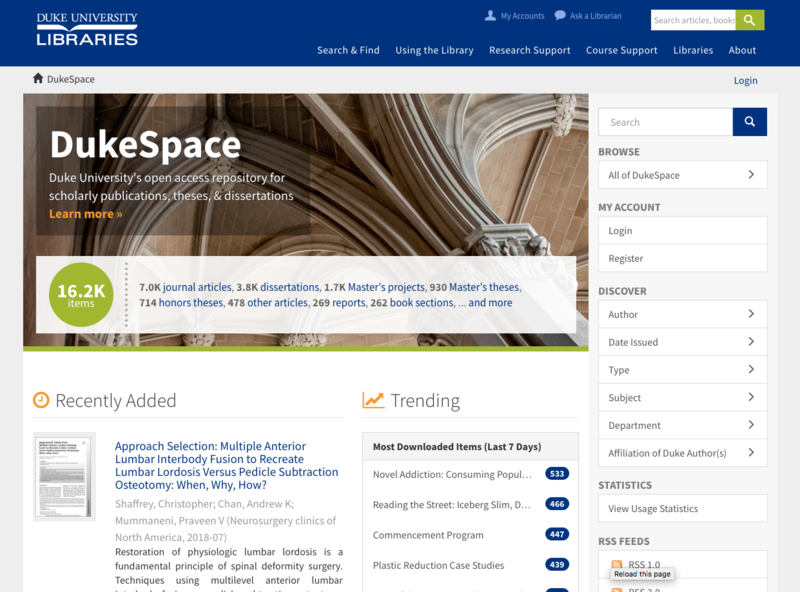 By scholars, we mean — in part — the global audience of researchers openly discovering and using the articles in DukeSpace. But we especially mean the scholars at Duke who created them in the first place. 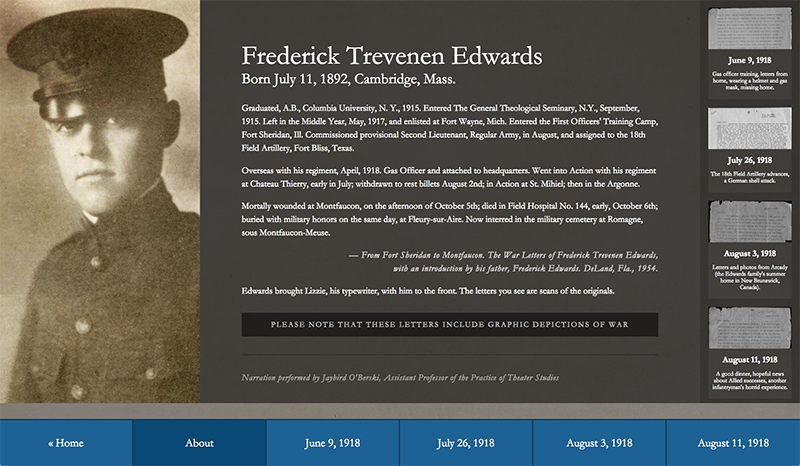 Item pages now display a brief embedded profile for each Duke author, featuring their preferred name, a photo, position title, and brief description of their research interests. This information comes from the scholars themselves, who manage their profiles via Scholars@Duke (powered by the open-source VIVO platform). 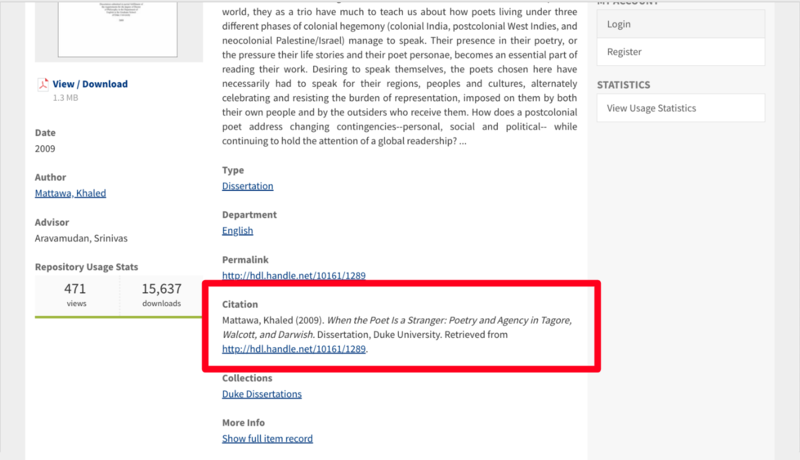 A brief author profile in a DukeSpace item leads to the full profile in Scholars@Duke. 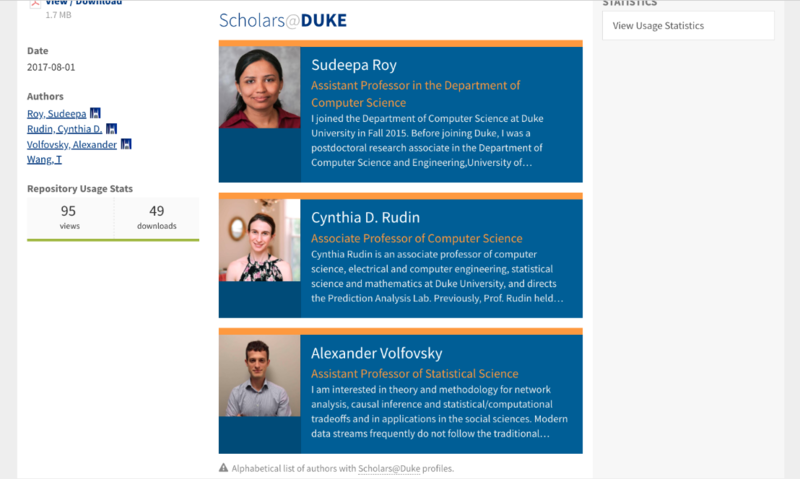 Scholars@Duke provides a handy SEO-friendly profile page (example) for each scholar. 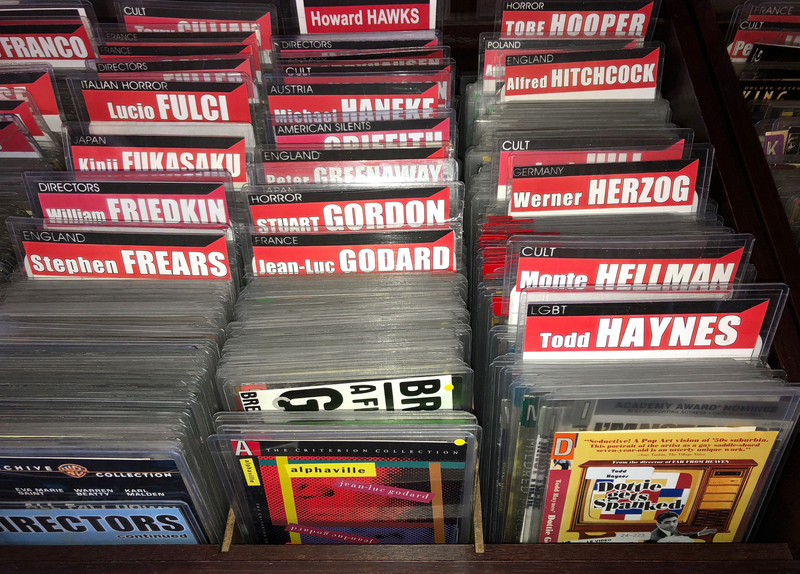 It aggregates their full list of publications, courses taught, news articles in which they’re mentioned, and much more. It also has useful APIs for building widgets to dynamically repurpose the data for display elsewhere. 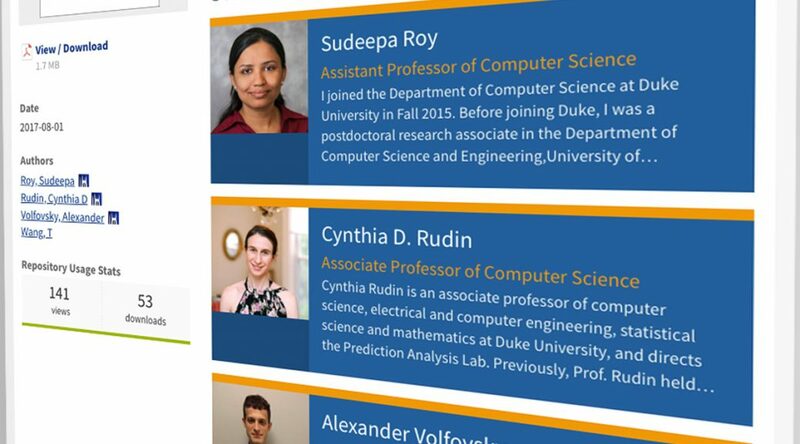 Departments throughout Duke (example) use these APIs to display current faculty information on their web sites without requiring anyone to manually duplicate or update it. And now, the library does, too. 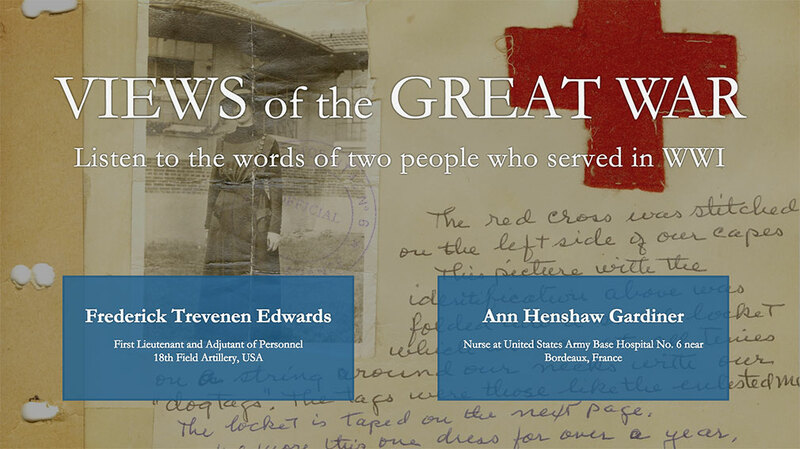 Scholars’ own descriptions of their research interests entice a visitor to learn more about their work. 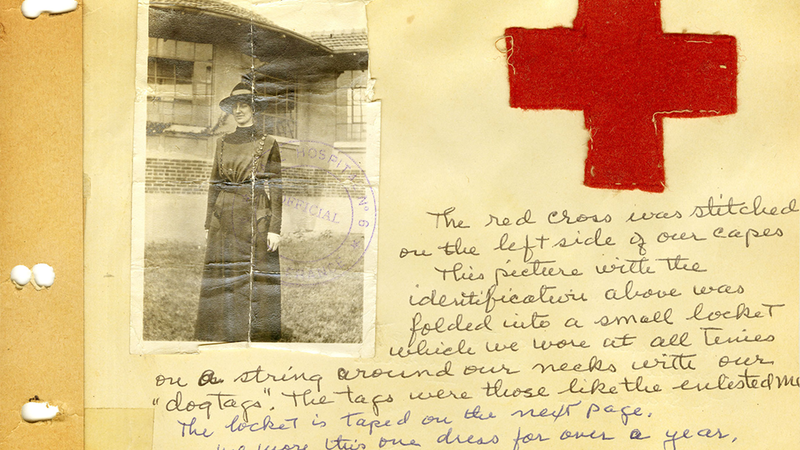 Uses a scholar’s own preferred current version of their name and title; that may not be identical to what is stored in the item’s author metadata. 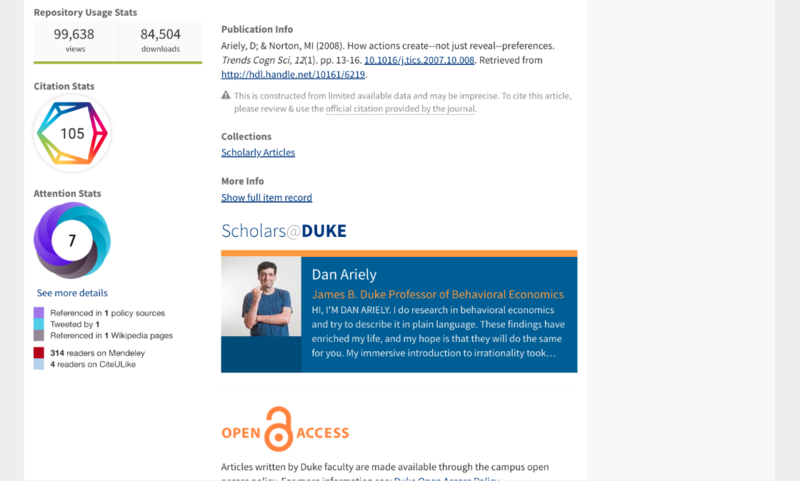 Puts users one click away from the author’s full profile at Scholars@Duke, where one can discover the entirety of the author’s publications, open-access or not. 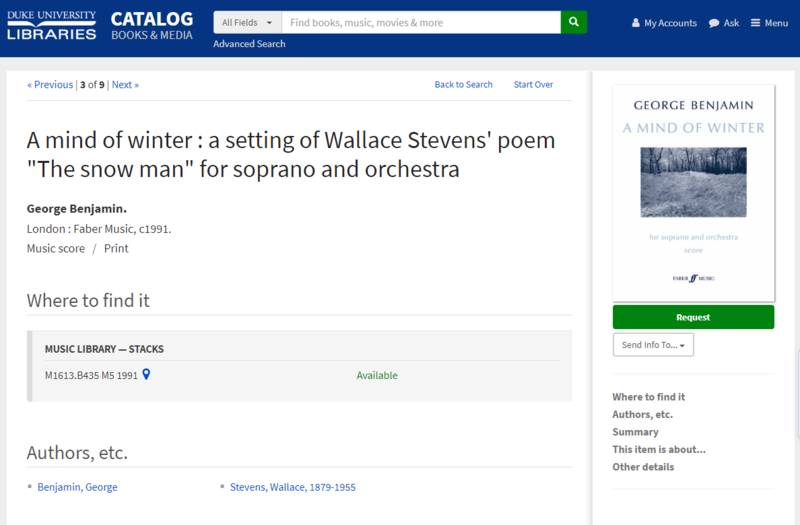 Helps search engines make stronger semantic connections between an author’s profile information and their works available online. 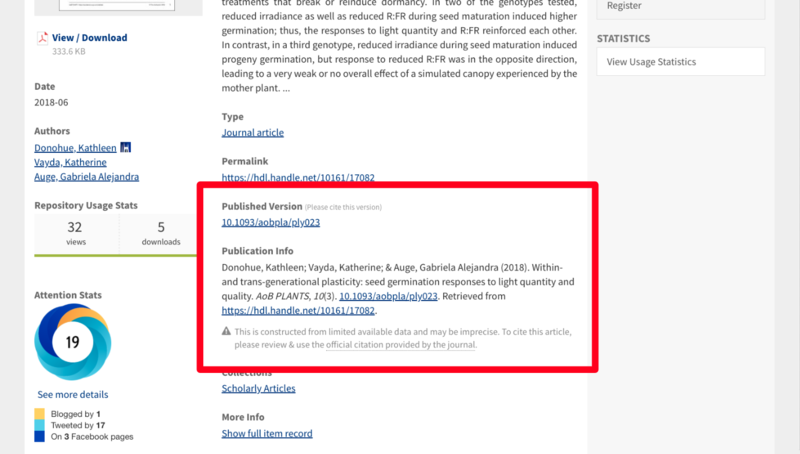 Introduces a unique value-add feature for our open-access copy of an article that’s unlikely to ever be possible to replicate for the published version on the academic journal’s website. Makes the DukeSpace item pages look better, warmer, and more inviting. With this feature, we are truly pushing beyond the boundaries of what an institutional repository traditionally does. 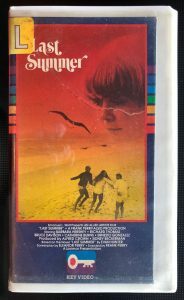 And likewise, we feel we’re raising the bar for how academic research libraries can showcase the members of their communities alongside their collected works. We now present an easily copyable citation, composed from the various metadata available for each item. This includes the item’s permalink. In cases when there’s a published version of an article available, we direct users to review and use that citation instead. 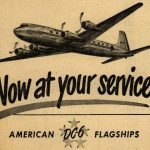 DukeSpace article with a DOI for a published version. 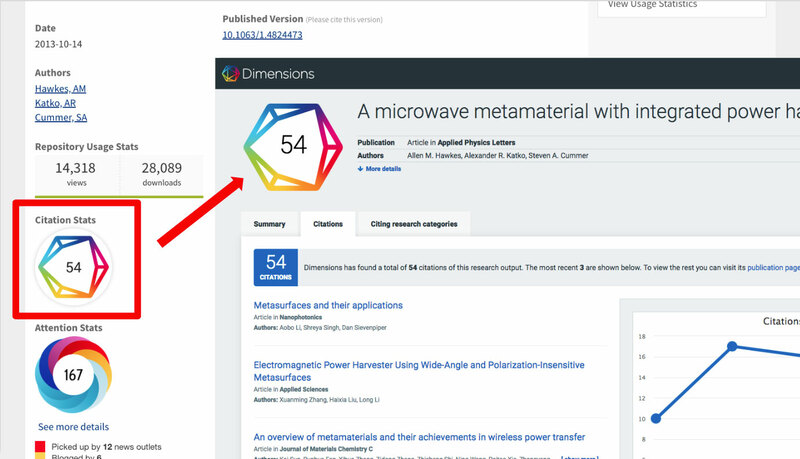 Item pages also now display a “Citation Stats” badge in the sidebar, powered by Digital Science’s Dimensions tool. Click it to explore other scholarly work that has cited the current item. Finally, we topped off this project phase by redesigning DukeSpace’s homepage. Notable among the changes: a clearer indication of the number of items (broken down by type), a dynamic list of trending items, and streamlined menu navigation in the sidebar. Duke Libraries’ current strategic plan emphasizes the mission-critical importance of our open-access publishing and repository efforts, and also demands that we “highlight and promote the scholarly activities of our faculty, students, and staff.” This two-month DukeSpace enhancements project was a great opportunity for us to think outside the box about our technology platforms, and consider how those goals relate. Many thanks to several people whose work enabled these features to come to life, especially Maggie Dickson, Hugh Cayless, Paolo Mangiafico, and the Scholars@Duke team.